Enter our February contest!Chairside Premium Bleaching Package: SALE! It’s been awhile since our last update! The past couple of weeks have been full of painting, building, and adding finishing touches to the construction. Believe it or not, the renovation is nearly over. We were so fortunate to have good weather and amazing patients who were excited about the changes happening here. If you haven’t visited in awhile, I can guarantee that you will not recognize the place! We will be posting pictures of the finished product soon, so make sure to stay tuned. Another update: our March contest has begun. This time, we are giving away gift cards to some great local places to get food and drinks. To enter, like our page on Facebook and find the image below on our page. 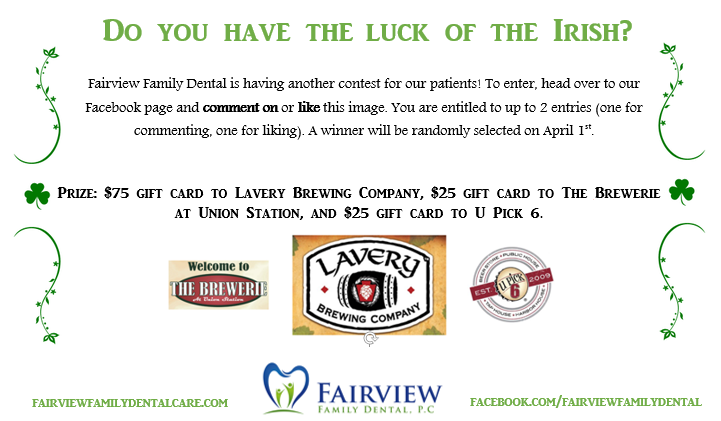 Comment, like, and share the post in order to enter! You will receive 1 entry for commenting, 1 for liking, and 2 for sharing.